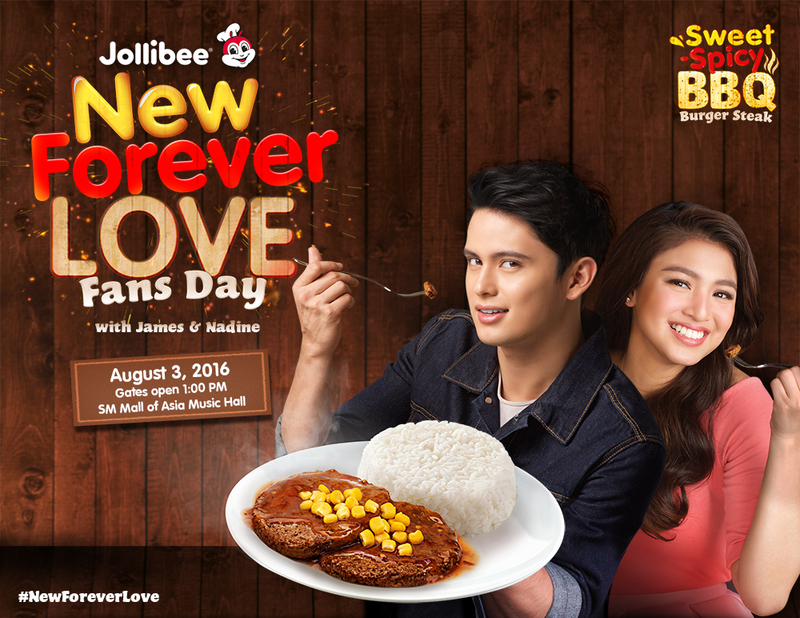 Jollibee to celebrate "New Forever Love" with JaDine! MANILA, Philippines - Ready to meet James Reid and Nadine Lustre’s "New Forever Love"? This Wednesday, August 3, 2016, Jollibee and JaDine loveteam are throwing a super-kilig, sweet-spicy get-together at the SM Mall of Asia Music Hall and all their fans are invited! The New Forever Love Fans Day is set to deliver maximum kilig for all #TeamReal fans through their special performances and fun activities. The event is open to all, but the first fans to take selfies by the photo walls at the venue can get VIP passes for the event and coupons to try the NEW Sweet-Spicy BBQ Burger Steak! Lucky fans can also get the chance to meet and greet their favorite love team on stage! Early this month, Jollibee announced the launch of their latest product innovation: The NEW Sweet-Spicy BBQ Burger Steak. Made with 100% pure beef patty topped with Sweet-Spicy BBQ sauce and corn kernels and served with steamed rice, this new product is a result of Jollibee’s commitment to create better dining and flavor experiences to its customers. The NEW Jollibee Sweet- Spicy BBQ Burger Steak is available for both one-piece solo at P50 and one-piece Value Meal at P55. They are also offering this new product with two-piece Solo at P80 and two-piece Value Meal at P85 (prices may vary according to store location). The Sweet-Spicy BBQ Burger Steak TVC stars two of today’s hottest TV personalities, reel-to-real life couple James Reid and Nadine Lustre. Watch the TVC on Jollibee’s Facebook page (facebook.com/JollibeePhilippines) and follow what the nation is saying about JaDine’s new Forever Love through the hashtags #NewForeverLove and #SweetSpicyBBQLove.